When Lydia Pinkham (1819-1883) began selling her patent medicine in the mid-nineteenth century, she advertised it as a panacea for all sorts of “female complaints.” Whether you suffered from “neurasthenia,” from menstrual cramps, from infertility, or from postmenopausal depression, Lydia Pinkham’s Vegetable Compound was the drug for you. It made Mrs. Pinkham and her descendants a bundle: as described by James Harvey Young in his book, Toadstool Millionaires, the remedy grossed $300,000 in the year of her death and in 1925, it earned a profit of $3.8 million. I’m not sure what that is in 2017 dollars, but it’s a lot. These potions remained unregulated until the passage of the Pure Food and Drug Act in 1906, at which point the labels were required to be “truthful” about their ingredients. 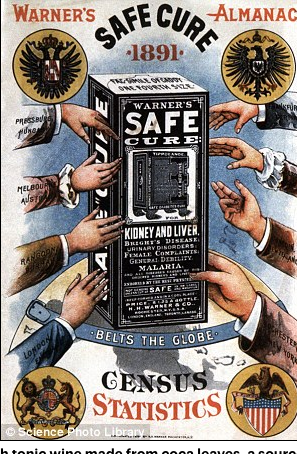 In particular, 11 dangerous substances including morphine, cocaine, and alcohol, which were frequently found in patent medicines (even in cough syrup for children) needed to be explicitly listed. There would be no evidence of efficacy required for another 32 years. In the intervening years, both physicians and the public gradually began to appreciate that any drug that was touted as the treatment or even the cure for as many as ten distinct diseases was almost invariably a fraud and the disseminator of claims of its miraculous properties a quack. No one drug can plausibly have so many unrelated beneficial properties. Today, we are afflicted with the inverse of the one-drug-many-cures scam. We are bombarded with claims that a single disease can have many unconnected causes. And the disease for which such assertions are most commonly made is Alzheimer’s disease. A few years ago, the media was all riled up by an article purporting to show that the anti-anxiety drugs, benzodiazepines, were associated with an increased risk of Alzheimer’s disease. A year later, we learned that anti-allergy medicines and some antidepressants had also been associated with developing Alzheimer’s. Last year, the culprit was the class of anti-ulcer medications, proton pump inhibitors (drugs such as omeprazole). And now, instead of a medication, we have soda and other sugar-laden beverages allegedly leading to stroke and dementia. Really? Do all these substances launch innocent people on the path towards dementia? To be fair, there are disorders with multiple well-established risk factors. Coronary artery disease, for example, is associated with elevated cholesterol, diabetes, high blood pressure, and smoking. But in this case, we understand something of how the disease develops and how each of these risk factors affects that pathway. High blood pressure damages the lining of the coronary arteries, and the resulting areas of inflammation tend to trap cholesterol, producing plaques, etc. There are also single substances that produce diffuse toxicity: cigarette smoking has been associated with lung cancer, bladder cancer, and cancers of the head and neck (three very different types of cancer), as well as with heart disease and stroke. But again, we understand the mechanism of action that is responsible for the disparate effects. In the case of dementia, the connection between benzodiazepines and dementia, allergy medicine and dementia, proton pump inhibitors and dementia, and now soda and dementia, is purely statistical. Nobody has made a plausible argument for how each of these agents might work to trigger Alzheimer’s—even though we now know quite a bit about how the disease develops. No one has made a good argument because they haven't found one. Nor is there a persuasive statistical argument. The studies based on which all these factors have been implicated in causing dementia are retrospective, non-randomized studies. The authors try to control for various “confounding factors” that might be the real explanation for the association, but they might not know what the relevant factor is or they might not be able to figure out if it was present or not. For example, maybe people who were ultimately diagnosed with Alzheimer’s disease were more likely than others to have taken benzodiazepines a few years before their diagnosis because they were already exhibiting very early symptoms, and those symptoms created anxiety. Much exciting research is underway on Alzheimer’s disease, research that may someday result in treatment, prevention, or even cure. But fishing expeditions to come up with a commonly used drug or other substance as an explanation of this complex disease are a distraction. We don’t need people abandoning their ulcer medication or their allergy treatment out of an ill-founded fear that they are bringing dementia upon themselves. Stirring up hysteria—and potentially depriving individuals of good drugs—is a really bad idea.